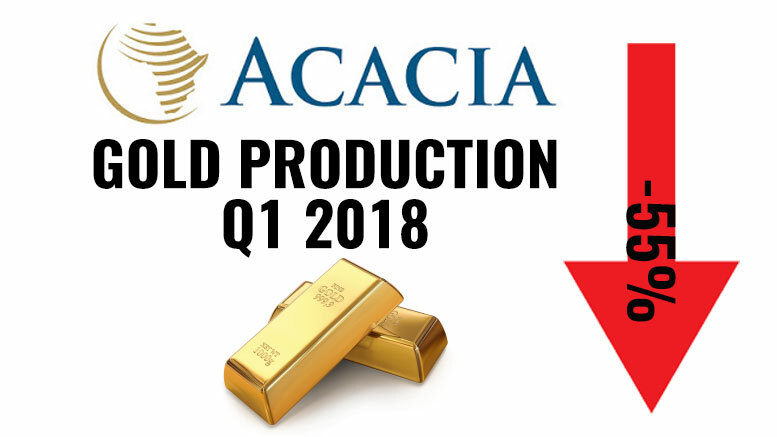 Acacia Mining (LSE: ACA), the largest gold producer in Tanzania, announced that gold production for Q1 2018 was in line with expectations at 120,981 ounces, a 55% decrease on Q1 2017 (219,620 ounces). The Company operates three mines in northwest Tanzania—Bulyanhulu, Buzwagi, and North Mara. Gold ounces sold for Q1 2018 of 116,955 ounces were slightly below gold produced for the quarter as a result of the timing of shipments. The decline in production was primarily driven by the move to reduced operations at Bulyanhulu mine and to stockpile processing at Buzwagi mine. On September 2017, the company announced the decision to reduce operational activity, driven by unsustainable cash outflows at the mines due to the mineral concentrate export ban introduced by the government of Tanzania in March 2017. At North Mara, gold production of 76,769 ounces for Q1 2018 was, as expected, 20% lower than Q1 2017’s strong, grade-driven performance of 96,468 ounces. At Buzwagi, gold production of 35,685 ounces for Q1 2018 was 41% lower than in Q1 2017 (59,856 ounces). At Bulyanhulu, gold production for Q1 2018 amounted to 8,527 ounces, 87% below Q1 2017 (63,346 ounces). Acacia is currently on a raw with the Tanzanian government after a presidential committee found that the company allegedly under-declared its exports. The gold producer refutes the accusation and is in talks with the Government of Tanzania for a resolution.